B. Thomas (Arlington, Texas, United States) on 13 February 2018 in Lifestyle & Culture. Can you find the climbers? El Capitan is probably the most recognized chunk of rock in the world to rock climbers. 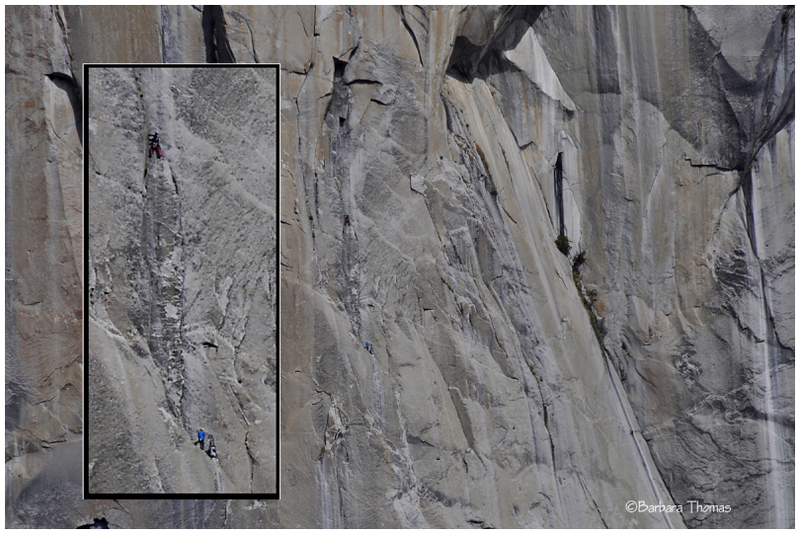 Climbers come from across the globe to challenge themselves on the 3000 foot walls of El Capitan. It's an awe-inspiring thing that first time you go to the Valley and stand at the base, looking up. This is a telephoto shot from the base of some climbers on their way up. The insert to the left is a cropped close-up version of the same shot. Mountain climbing is not suitable for me. I am beginning to feel dizzy fast high, It's good that you've emphasized the climbers. Maybe I would not have noticed them otherwise. It's a notorious climbing wall which dwarfs the climbers. I hope they all came down safely. I's not for me. Impressive! wow what a massive height !! They look like toys !!! Wouhaaaaaa!! bravo à lui ! What an impressive shot of this massive rock! Wonderful! The dimensions and proportions are absolutely awe-inspiring! Can you imagine climbing this 3,000 ft wall of solid rock alone and without ropes or other applieances? American free climber Alex Honnold did so in 2017 for the first time! What an incredible achievement! Oh yes , I see them so small there ...Superb presentation. Happy ST! I am glad you gave me the inset to help locate the climber. The tiny climbers help us grasp the enormous size of this mountain. A fine picture. I can see them, beautifully photographed and presented in this way. Wow!! What a dramatic comparison!! It really illustrates El Capitan's massiveness. Great capture and comparison! An amazing image of an amazing feat. I can't imagine anyone wanting to do that. I have seen a documentary, it takes quite a while to get to the top, they even sleep half way up there, amazing.